Lucas St. Clair (center) talks to Jessica Masse and John Hafford before announcing his candidacy for the 2nd Congressional District on Monday. 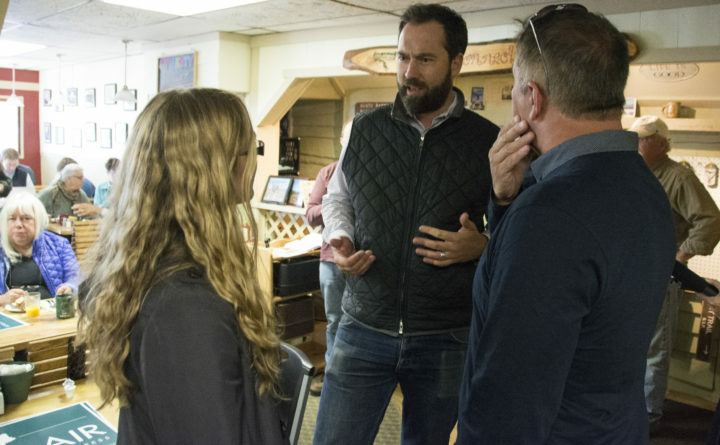 The man who led a successful campaign for the creation of a national monument on Katahdin region land his family gave to the federal government is running for Congress. Democrat Lucas St. Clair announced his candidacy for Maine’s 2nd Congressional District with appearances in Millinocket and Bangor on Monday. He joins a June Democratic primary field that includes five others seeking to challenge incumbent Republican Bruce Poliquin. Assistant Maine House Majority Leader Jared Golden of Lewiston is the most prominent candidate in that field. The 39-year-old son of Burt’s Bees entrepreneur Roxanne Quimby has never held elected office and is planning to move soon from Portland to Hampden, but said his years of experience helping create Katahdin Woods and Waters National Monument in 2016 helped him understand the problems of northern Maine. Poliquin adviser Brent Littlefield described St. Clair as a dilettante embarking upon “his next life quest” by running for Congress after spending much of his adult life out of the district — the same criticism Democrats leveled at Poliquin when he ran in 2014. “From being an attempted gourmet chef through his college training in London, to a wine expert in Seattle, to spending his family’s money ignoring the will of local voters, he has moved on to thinking he should be a politician,” Littlefield said. St. Clair, who is paid to run the Quimby family’s nonprofit foundation, Elliotsville Plantation, as its president, rapped Poliquin, a former state treasurer serving his second term in Congress, as “unresponsive” to the district’s needs. Poliquin’s vote in May to replace the Affordable Care Act with a House bill, which St. Clair said would cut health care to 110,000 Mainers, was an example of Poliquin “putting the interests of his political party ahead of the real families and real lives of families here in Maine,” St. Clair said. St. Clair said his ties to the district include having been raised in Dover-Foxcroft in a cabin lacking electricity and water, launching a restaurant in Winter Harbor — called Mama’s Boy Bistro — and running the monument campaign, for which he traveled Maine extensively. Yet voters of the 2nd Congressional District have increasingly switched allegiances to Republicans, including Poliquin in 2014, Donald Trump in 2016 and a clear majority of legislative races. Poliquin first won the seat, which had been in Democratic hands for two decades, in 2014 as an underdog against Democrat Emily Cain of Orono. Golden, 34, is viewed as the frontrunner in the Democratic primary. A resident of Lewiston, a Democratic Party stronghold, he was recruited by national Democratic Party groups in part because his status as a Marine veteran who served in Afghanistan and Iraq makes him a formidable opponent for Poliquin in a district where treatment of veterans has been a key issue. St. Clair also faces opposition from Democrat Jonathan Fulford of Monroe, a carpenter and plumber who twice ran unsuccessfully for the Maine Senate seat currently held by Senate President Mike Thibodeau, a Republican from Winterport. Three other Democrats, Philip Cleaves Jr., Craig Olson and Timothy Rich, have already entered the race. St. Clair said he was unsure how much of his campaign would be self-financed. Campaign contributions are important, he said, describing them as being as much statements of support as financial necessity.